On the day I became a sister there was an Incorporation Ceremony before friends, family, and a whole host of Daughters of Charity. 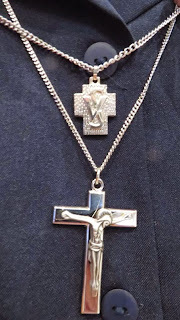 I wore my full habit for the first time, and during Mass I had placed around my neck a cross marked with SV (for St. Vincent); it is the universal sign of the Company of the Daughters of Charity of St. Vincent de Paul. Worn by 17,000 sisters around the world, it is “a distinctive sign which identifies them as Daughters of Charity” (C.41). Not quite as loud as a coronet, but still a visible sign. When I pronounced my vows for the first time, I was given another cross. Larger and heavier than the first, this crucifix was pressed into my hand in an inconspicuous gesture before Mass began. Unlike the universal sign, I had not seen this on all Daughters of Charity. 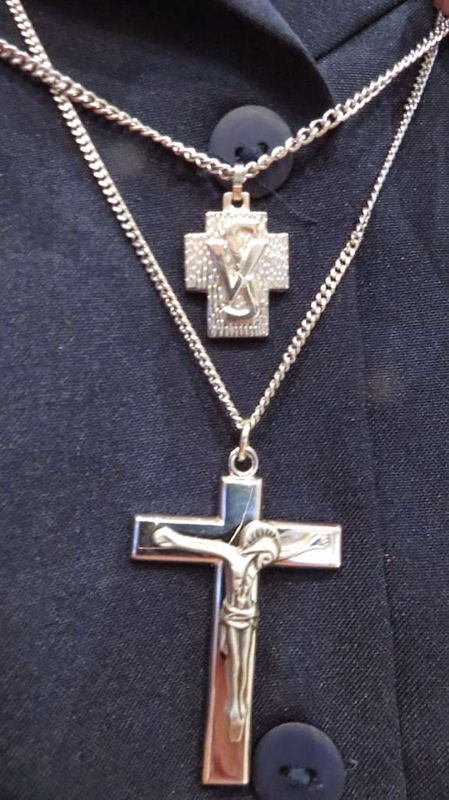 After Mass one of the sisters came up to me and pulling at a chain hidden beneath her collar she revealed her own vow cross worn since her first vows many years ago. It felt as though she was letting me in on a secret of her joy. This unseen cross seemed right to me, though I couldn’t exactly say why. The words came to me soon after when tragedy touched the place where I work. A teen in our program had been killed. Everyone was preparing to head out for a candlelight vigil to mourn and show support for the family. I planned to go too- to be a visible sign along with the staff, volunteers and other youth. But they needed someone to stay and keep the gym open. Nearly everyone was going to the vigil; the gym was basically empty, but needed to be open to welcome any other youth who might arrive. So I stayed. A thought came to my mind along with the image of that sister’s well-worn cross: this is what it means to be a servant. There is a time for public witness, but underneath the signs and symbols a Daughter of Charity is first and foremost a servant.